B&W view of Needle Telegraph. 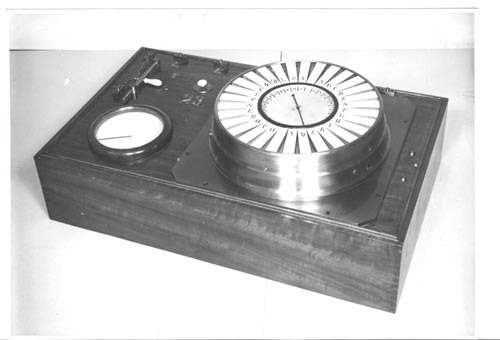 This device consists of a circular dial with letters and numerals and a needle pointer. On the left is a meter of some type and a switch with handle to select K, T, Z. The numberal 23 is below a pushbubtton. Verso in German: " Trimenscher Zeigertclegraph, 1847" "Bildarchiv W.-v.-Siemens-Institut, Munchen"